First, I would like to say thank you for reading, Cardiovascular disease prevention is really important and I want to you and your families to be safe. All of us have had family members who have had some sort of heart or artery injury from a heart attack to a stroke. The more information we have the better all of us can work to prevent this type of injury from happening. We have all grown up with the that cholesterol is the enemy of your arteries, we talked about a few weeks ago. This writing is about what is important to test and why. The Journal of the American Medical Association 1998; 279: 1615-1622, published a study on heart attack rates comparing a placebo group (not taking any cholesterol medication), and a group using Lovastatin. The placebo group had 183 acute heart attacks and the Lovastatin group had 116. The group taking the cholesterol medication had significantly less heart attacks compared to the group that took nothing. What I want to point out is 116 people taking medication still had heart attacks, it simply is just not good enough. It should be 3 people or less that had a heart attack. It was like that in the 1920’s and 1930’s, a heart attack was a rare thing. More conversation on that next week. How does cholesterol medication work? Cholesterol drugs are two medications in one. An anti-inflammatory drug mixed with a cholesterol lowering drug. The active ingredient is a highly prized formula for reducing inflammation in the arteries mixed with a second drug that lowers cholesterol. The purpose of lowering cholesterol is to measure dosing and makes marketing easy and popular. It is not the active ingredient. The theory for this treatment started in the late seventies with a researcher named Bob Mahley. He first described the theory of cholesterol’s molecular size and it’s relational effect on inflammation in the arteries. I looked up his research and his writings had to do with oxidization of cholesterol. Swine lipoproteins and atherosclerosis. Changes in the plasma lipoproteins and apoproteins induced by cholesterol feeding. RW Hahley, KH Weisgraber, T Innerarity, HB Brewer Jr. Biochemistry, 1975. Enhanced binding by cultured human fibroblasts of apo-E containing lipoproteins as compared with low density lipoproteins. TL Innerarity, RW Mahley. Biochemistry, 1978. Oxidized cholesterol is very harmful to the arteries, think of eating rancid butter. He used the findings of oxidized cholesterol and began the theory that size of the cholesterol particles determined the rate of oxidization. Going to today, Lancet published an article” Yusull, Lancet 2004; 364: 937-52 discussing the measurement of cholesterol size correlating this to heart attack incident. When you look through the article there is a correlation to a ratio of large and small cholesterol sizes when people had a heart attack. They were seeing a pattern, a certain ratio of cholesterol large and small sizes that were present during a heart attack. What they were looking at was the movement of LDL cholesterol particles by what you would call a barge, Apoprotein A and B. The Apoprotein A and B ratios changed during a heart attack. This theory that movement and counting particle size leads to a heart attack simply has a poor outcome record. If it worked you would not have the rate of heart attacks that we do now. You have to be able to measure inflammation in the heart arteries to predict if you are safe or not. 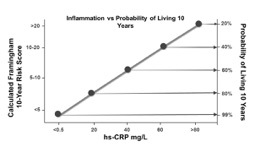 If your measurement for inflammation is not good, where is the inflammation coming from? The rate of heart attacks tells me we can do a better job at this. There are three tests that actually have a predictive qualities for a healthy life and scientific proof to back them up. This measures inflammation in the artery. Our ability to predict artery damage is directly related to how high this number is. The importance with the below graph is there is very little artery damage and prediction of a healthy life is excellent between .5 and 1.5. The rate of life expectancy changes dramatically as this number goes over 2. The second test is Homocysteine. Proteins that we eat are broken down into amino acids that are eventually removed through the urine. The breakdown process requires a healthy amount of B vitamins and magnesium. If any one of these are low the breakdown of protein will stall and we will get a build up of a particular amino acid called Homocysteine. Homocysteine is a very strong artery irritant. 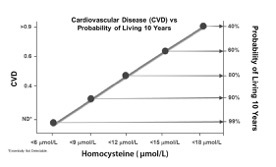 The below graph shows a direct relationship with the level of Homocysteine and longevity. If you get over 18 you have a 50-50 chance of not being around within 10 years. 1997 New England Journal of Medicine Nygärd. This test is very important from a nutritional perspective. If it is high we are not meeting your nutritional demands. We can correct for that, we can lower this before it damages the artery. If we see an elevated Cardiac C reactive protein we know we have artery damage actively going on, but why? Is it the break down of proteins – Homocysteine or is it my cholesterol? We can find this out by measuring the oxidization of LDL cholesterol. LDL lipoproteins are very sensitive to oxidization. Is my cholesterol bad for my arteries? Cholesterol full of antioxidants is very stable and is an excellent food source for the arteries. If the cholesterol, made by the liver, is being made without enough anti-oxidants (not enough fruits and vegetables) the cholesterol will not be stable in the blood stream and will oxidize. Oxidized means the cholesterol has gone rancid. The cholesterol is breaking down and will damage the artery cell that takes it in as a food source. You have to remember these artery cells work very hard with blood flowing through them constantly, they need lots of energy, and cholesterol is an excellent food source. I like these three tests. The test results will tell you if the arteries do have inflammation that is damaging them, how bad is it, and is it the cholesterol or the Homocysteine that is causing it. We can predict long term if you are safe or not and what we need to get you back to healthy. You don’t have to wait for things to happen. We ca be proactive. Thanks for reading. Next week I will put this together on what to do to keep a healthy heart and cardiovascular system.